This is one of those stories where, if I were writing it about a black family, it would have an entirely different headline and an entirely different outcome, because that’s how these things work in our society right now. 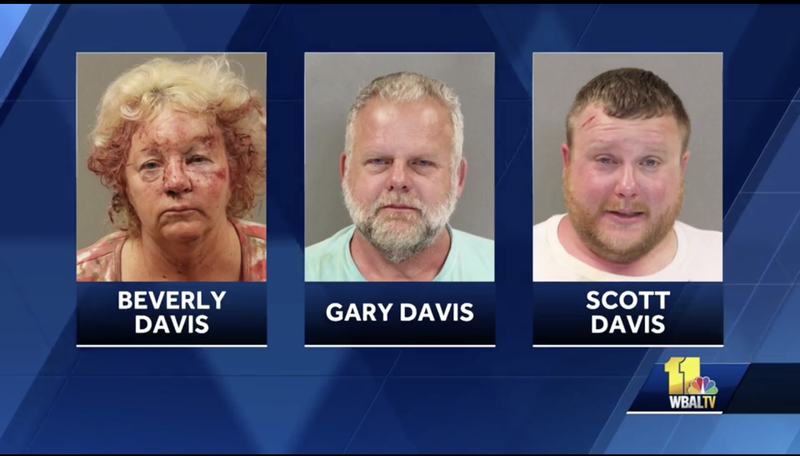 A husband, wife, their son and an unidentified juvenile relative were all arrested in Middle River, Md., when a family gathering got out of control. WBAL-TV reports that police were summoned to respond to a domestic disturbance, and when they got there, all hell broke loose. When officers arrived on the scene, they encountered Beverly Davis—whom they described as being confrontational and aggressive. When her husband, Gary Davis, tried to intervene, she turned and began attacking him. When an officer tried to stop Beverly from assaulting Gary, Gary reportedly turned on the officer and held him in a choke hold until he fell unconscious. The three adult Davis family members as well as their juvenile accomplice were eventually arrested and charged with multiple crimes, with Beverly facing two counts of assault on a law enforcement official. They were taken to jail, and the two officers who caught the fade were treated at a local hospital for non-life-threatening injuries. No word yet on whether or not the Davis family were given their celebratory trip to Burger King.